Info "Pick your moment and throw!" Dartistry is one of Jimmy T.'s microgames in WarioWare: D.I.Y. 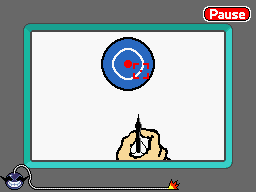 The game is based on the sport of dart throwing. The point of the game is to throw the dart anywhere on the dartboard. The hand holding the dart moves around erratically, though. Another target is shown, depicted as a small red circle enclosed by a broken square. This is the aiming mechanism and shows where the dart will land. Tapping the screen releases the dart. If the dart lands on the target, the game is won. However, if the dart lands on the wall or if time runs out, the game ends in a loss. This page was last edited on October 4, 2018, at 20:49.